The Peoples Republic of Stokes Croft would like to express their shock at the news that councillors have received threats of violence and even threats to their lives. We condemn these actions. There is no place in political debate, or wider society for this kind of personal intimidation and threat. We are deeply disappointed that the Labour group did not respond to the substance of the petition. 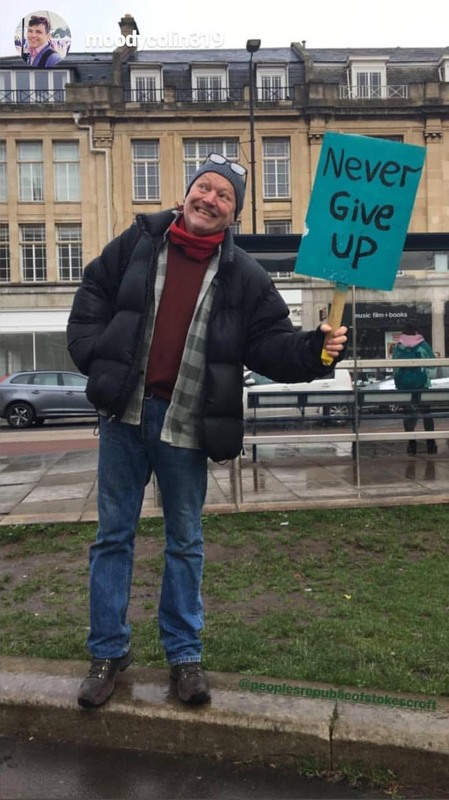 Represented by Cllr Brain, they thought it reasonable to counter a petition signed by over 4000 Bristolians with a casual vox-pop of “about a dozen.” This shows the council’s casual disregard for the people of Bristol and their opinions, an impression that was only reinforced by the comments of the Deputy Mayor Cllr Asher Craig. In her justification of the order to remove Ursa the Bear and the community infrastructure, she referred to several incidents, at least two of which (occupation and arson in the closed toilets) happened after BCC “took back control” in early 2018 (and none of which involved the structures referred to in the petition). The statement from Inspector Mark Runacres of Avon and Somerset Police also referred to a rise in violent and anti-social crime, but covered a period which was mostly after BCC had taken back control. 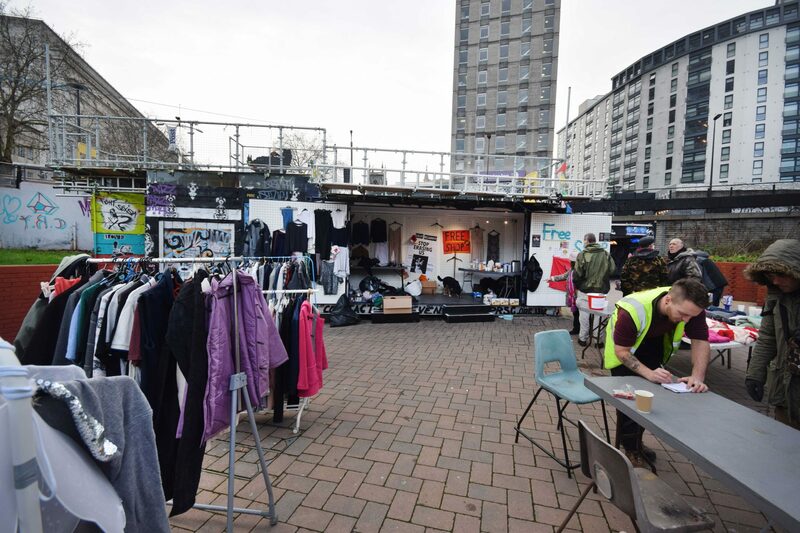 The only positive activity that we have seen in the Bearpit this winter has been the Free Shop (delivered by Bristol Housing Action Movement), offering warm clothing, hot drinks and phone charging services to the homeless community. The removal of the infrastructure which allowed this to happen would clearly be a waste of existing resources. Cllr Craig stated she wished to communicate with the reasonable parties involved. We look forward to hearing from her. Thus far we have only received anonymous notices from the BCC legal department. Below are our thoughts on how we can resolve the impasse over the Bearpit. With special thanks to Colin Moody for supplying the two beautiful pictures above, and the feature image on this blog. Thank you to all the wonderful people who have offered us help and support in this campaign. 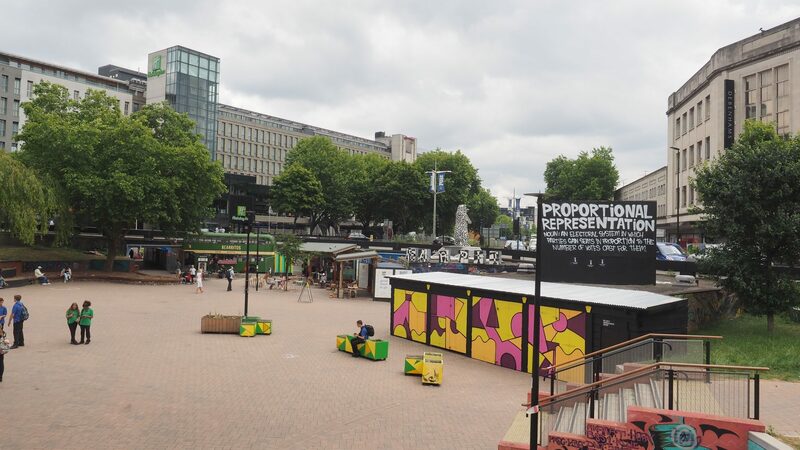 1) No infrastructure should be removed from the Bearpit until and unless an alternative plan for the Bearpit has been agreed through community consultation, and all planning permissions and a start date have been agreed. 2) The Bearpit should be taken out of the Broadmead Business Improvement District. This change was instigated in November 2017 by persons unknown, without public consultation, and represents further corporate takeover of public space and should not be tolerated. 3) The idea of the Bearpit as a cultural creative commons should be revisited. Involving both cultural organisations such as Arnolfini, Creative Youth Network, People’s Republic of Stokes Croft, Coexist, KWMC Arts Council England etc and Homelessness and drug agencies such as Transform, Bristol Drugs Project and Bristol Housing Action Movement. The survey carried out last year by the Arnolfini showed that what the people of the City want, above everything, is culture in their streets. 4) Adopt the idea of incremental change, as suggested by Henry Shaftoe, Founder of the Bearpit Improvement Group. Continue to adopt a low cost gentle bottom-up creative approach to the City’s most difficult urban space in a style that does not exclude its current inhabitants. 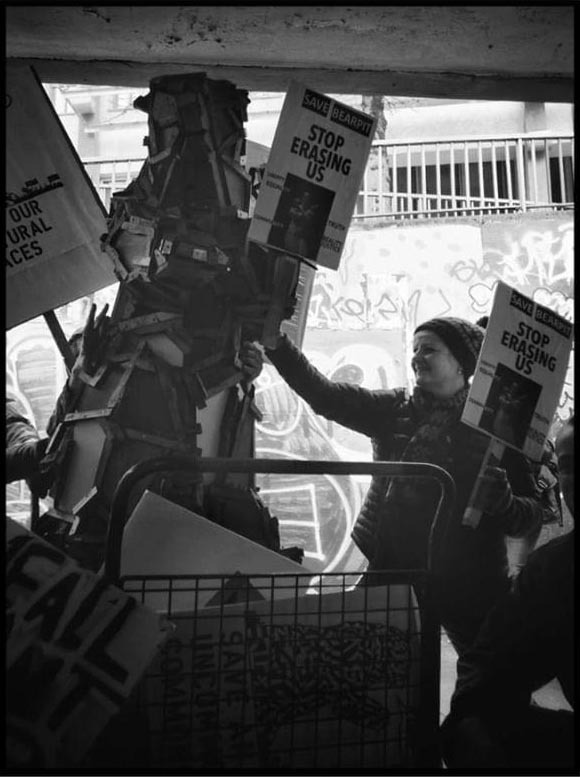 5) If Bristol City Council does, in its wisdom, decide that it wishes to remove all of the infrastructure from the Bearpit, then the Council must recognise its responsibilities, and enter into a negotiation with the stakeholders who have put in countless volunteer hours, and significant funds into the Bearpit. i) Compensation for time spent and costs of infrastructure placed in good faith in the Bearpit. 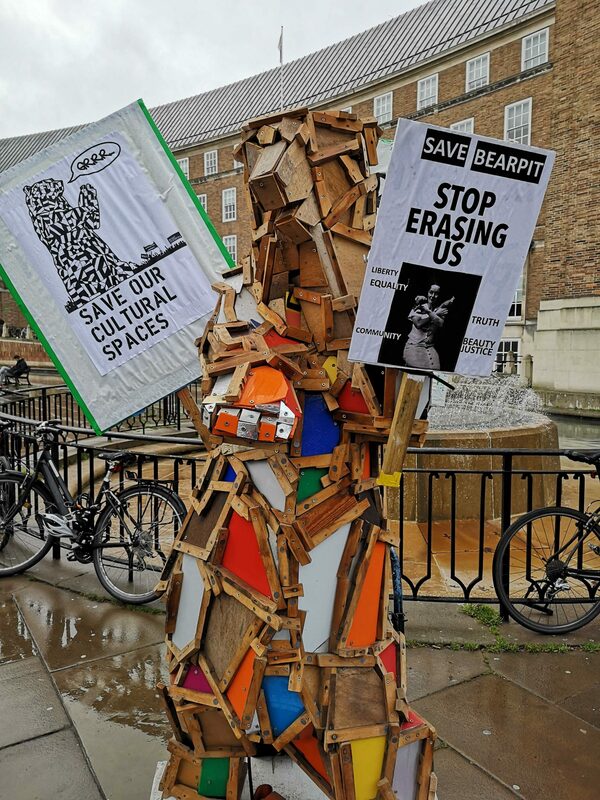 This will include compensation for the destruction of the Cube sculpture which was torn down under the orders of persons unknown without legal process in Whitsun 2018.
ii) Financial help in removal and disposal cost of all materials and infrastructure in the Bearpit. This will include costs of crane hire, road closure, transport and labour. iii) Consideration of alternative space in the City for structures such as the Bear and the Theatre containers. If all of the units, including the Council-owned bus are to be removed, then appropriate sites should be found for these units. The bus is an original 1979 Bristol VR and is of historic interest to the city. It’s such a shame that the councillors were not able to see past their own prejudices in regards to what was really happening at the bear pit. It’s seemed that the facts were not properly taken into account and there seems to have been misplaced attention on the death- threats ( probably by some one who is not of sound mind ) which had nothing to do with the bear pit managers and the art work there. Such a shame a misunderstanfing and direct undercutting of hardworking individuals and artists, at least there could be some acknolagement for the Tito that was fine there. The meeting appears to be a Shortsighted and sad outcome.